With the New Horizons probe quickly approaching its rendezvous with Pluto, I thought it might be fun to imagine just what it will find when it gets there. 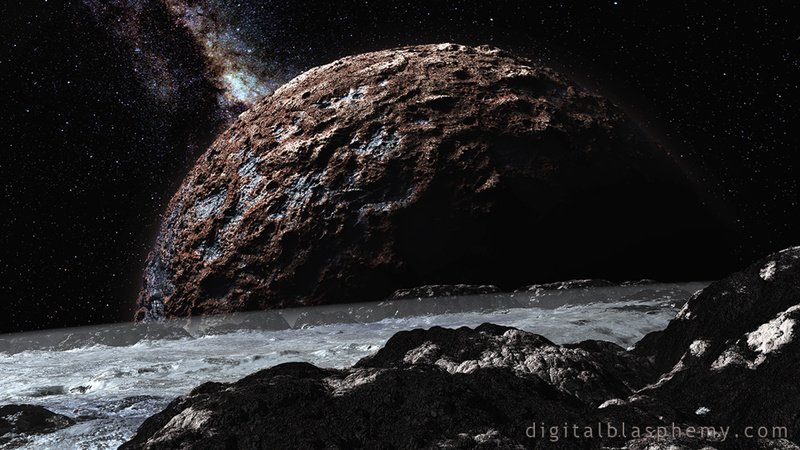 This piece isn't intended to be 100% scientifically accurate, but rather a fanciful (and hopefully artistic) view of Pluto from its moon Charon. Might be a good place to visit for a photo shoot or two. That atmosphere looks too thin to sustain life for long. "Pluto Flyby has nothing on this"
The Scientists taking of pictures of Pluto should have just called you. Yeah, I definitely like the revision (with the smaller moon/planet). Not that I had any issue with the original, it just seemed that the moon/planet took up too much of the frame, in my opinion. But yeah, well done was always, sir! I always liked the space/planet/nebulae wallpapers, this is no exception! Really neat conception, and I especially love the Milky Way in the background. Can't way to see the photos from New Horizons! no kidding created beautiful Ryan! Very nice, as usual. I can't help but wonder if the foreground planet has atmosphere? Is that haze fog? or a light ice layer? And the distant planet - what are the different layers - rock for the greyish, and the brown is... plant life? Different rock? Ryan your work is one of a kind. Once a member, always will be. Detail on the background planet in orbit is very sharp. Added to the desktop background rotation! This is amazing. I've been anxious these past few months watching New Horizons getting closer and closer. The more we learn about this distant the world, the more amazing it seems. This picture is a great visualization of that. This piece of art is a very good example of why I love your art and why I think it is great art. Your art caputres to the point so many things I associate with space and the universe: how alien it can be, how vast and grand, how beautiful, but at the same time, how cold it is, how lonely, and how mysterious, enigmatic, strange. 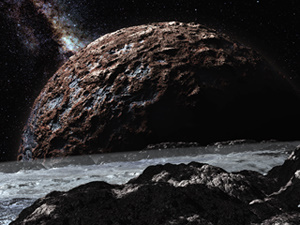 When you read popular science articles or books on topics abotu cosmology, astronomy and planetology, you very often find "artist's renderings" showing something which we cannot (yet) observe directly. However, very often, these renderings are dull, without true imagination. Almsot all the "artist's renderings" of Pluto and Charon currently sweeping through the media are nothing more than variations on "rockyy moons with craters" not really taking into account the vast richness of different possible rocky celestial bodies within our solar systems as photographed by spacecfrat like the Voyager probes or Cassini etc. How infinitely better your creations are! Looks good. Looking forward to the planet version. One of your best lately. I particularly like the level of detail in this one. This makes it really stand out on a hi-res monitor! On a side note: I've noticed that for a couple of your newest renders, the Surface Pro 3 resolution (2160x1440) is missing. Menger Bulb appears to have been the last one. Is that on purpose? Because I really love using your artwork on my SP3 because the high resolution on a 12 inch display makes the details look stunning. But I realize its aspect ratio is somewhat different, so if that is the reason, I could understand that. The finest piece of artwork ever released on June 31st. "So good I now kinda hate real satellite pics"
Ryan - you make such amazing artwork that makes me want so badly for them to be real places! I can't tell you how many sci-fi books I have read that are populated in my head with your images...real satellite images are almost disappointing. Very cool Ryan. Love the detail. Quite fanciful, yes. All the better and that's why we like it so much. I agree that the band of atmosphere (I think) is slightly distracting - I had to think about it for a while to figure out what was going on. I really enjoy the space-scapes you do. Was the reason for my lifetime membership! I wonder if we will get actual images that look like this from a probe. I love the detail in this one. A wonderful imagining. This is, honestly, one of my favorites that you've done. It's going right on my desktop! Love the detail and the overall look is creepy! This is a nice dark wallpaper and the Triscreen really does it justice! The planet's rocky and crater-pocked surface is great -- the deep blue and brown hues give it an attractive and realistic look. I'm not as crazy about the foreground; in particular, the misty white band at the horizon is too straight and uniform -- doesn't look quite real. And I'm not sure what the white surface is supposed to be; it looks a bit like ocean waves or a field of ice. Otherwise, though, terrific! This render is amazing Ryan!!! 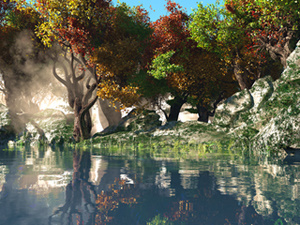 I love planetscapes and spacescapes and this render is both... Love it!! !